Thomas R. Marks is where sales and marketing thought leaders go for their thought leadership. Over the course of his more than four-decade career, Tom has counseled Fortune 500 Companies, and other organizations of all shapes and sizes, on the Disciplines of Market Leadership, how to use Critical Insight Selling™, his revolutionary selling approach that uses knowledge and insights to sell goods and services, and how to implement thought leadership positions into a company to distance themselves from the competition more decisively and with more dynamic narrative pitch flows and messaging. Because corporate ethics is a by-product of thought leadership, Tom also speaks about thought leadership and ethics within the framework of Socrates, Plato and Aristotle, a concept and keynote that has never been addressed or heard about from speakers today. Tom's content is 100% original. Tom founded TMA+Peritus, a nationally recognized marketing consulting firm more than 35 years ago, and over time has worked with leading clients including McDonald's, Foot Locker, Honeywell, Finish Line Sports, American Family Insurance, Rakuten OverDrive, Bombardier, Associated Bank, PowerSchool, FIS Global, California Avocado Commission, National Mango Board, the University of Wisconsin-Madison, Fresh Markets, Bally Entertainment, Lincoln Logs and countless others. Tom is the former President of the American Advertising Federation (Wisconsin Chapter), and with TMA+Peritus, is a 65 time winner of the American Advertising Awards. Tom is the author of hundreds of articles, white papers and stories including Of Socrates, Plato & Aristotle: How Thought Leadership Drives Stronger Sales, Marketing & Ethics; How To Put the ROI in Your URL; The Fall of Harvey Weinstein: Lessons in Screwing-Up an Already Screwed-Up Mess; and Is the Bankruptcy of Trust Diluting Brands? Tom was also the Sunday Marketing Columnist for Gannett Newspapers and ghost-wrote the widely syndicated newspaper medical column for Dr. Randal Wojciehoski, known as Dr. Wojo. Tom is also considered to be a master storyteller, understanding the art, science and neuroscience behind why storytelling increases both recall and recall accuracy in your sales messaging. His speeches and workshops are educational, insightful and bring practical and useful knowledge to any organization. Tom is a graduate of the Claremont Colleges, the same institution where his mentor, Peter Drucker, was a professor. Tom also studied creative writing and historical fiction overseas spending time with the greatest English Working Class authors of all-time including Alan Sillitoe (The Loneliness of the Long Distance Runner), John Wain (Hurry on Down), John Braine (Room at the Top, Life at the Top, The Crying Game), Kingsley Amis (Lucky Jim), Arnold Wesker (The Kitchen, Chicken Soup with Barley), and Ann Jellicoe (The Sport of My Mad Mother). “If you ever have the chance to see Tom Marks speak, I strongly encourage you to run, not walk to the event. Tom is one of America’s top sales and marketing thought leaders and brings four decades of experience to any organization. 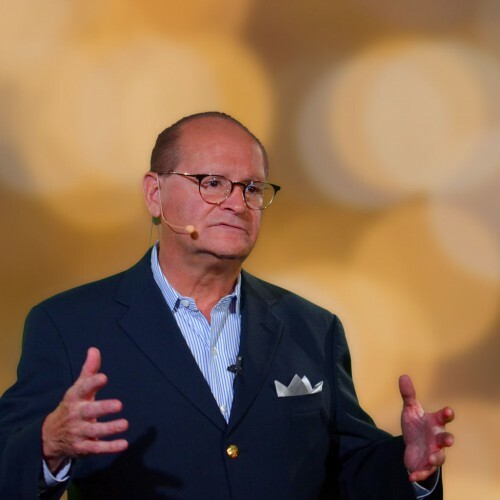 And, if you’re a meeting planner, make sure you schedule Tom for not just his dynamic keynote, but also for his workshops that will give any company a better understanding of the Disciplines of Market Leadership. Tom is the person where thought leaders go for their thought leadership.” --Jon Gadbois, VP-Marketing, Boston, Inc.
Find out more about Thomas R. Marks at https://thomasrmarks.com/.